This is a review I wrote for the Quietus on the recent Kraftwerk perforance of their album The Mix at Tate Modern. The question of whether Kraftwerk needed to do a remix album way back in 1991 will not be answered by tonight’s show at Tate Modern, the penultimate concert of the series and perhaps the most “Greatest-Hits-y” of the lot, which, from what I hear when discussing the event with friends and fellow concert-goers, is saying something. As I wander into this illustrious gallery’s cavernous turbine hall, swearing under my breath over the price of a can of lager, I’m struck by a realisation that won’t leave me for the rest of the evening: I know what I’m going to get tonight. 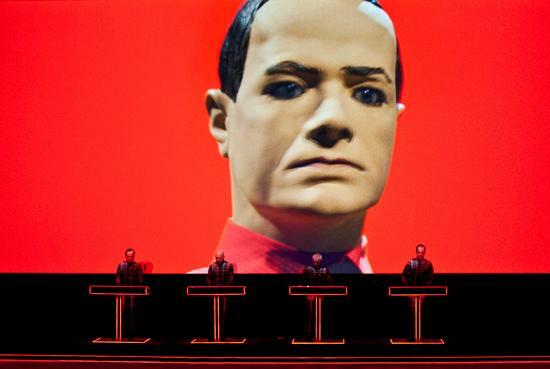 Perhaps more than any other band in pop music, Kraftwerk have become masters of note-perfectly recreating their studio creations in a live format. I also know that there will be 3D visuals and, beyond The Mix, a smattering of fan favourites from the band’s back catalogue (the latter information courtesy of all the hubbub this retrospective has, somewhat bizarrely, caused. Any excitement I initially felt was quickly dampened by the ticket prices and effectively annihilated as I cried when handing over five pounds per drink consumed. Ok, maybe that’s bugged me inordinately…). So, if surprises are definitely off the menu, beyond the booze (let it go, Burnett! ), what is there really to look forward to? I mean, this is The Mix we’re talking about. About as far from a career high-water-mark as Kraftwerk got. Well, these are still great tunes, aren’t they? And, at the risk of being called a heretic, I think The Mix versions of “The Robots” and “Radioactivity” improved on the originals quite substantially, making them pacier and, somehow, more fun. Aided by the decent acoustics within the turbine hall, both pack a decent punch and quickly get the punters dancing, which is an impressive feat when wearing flimsy 3D glasses. Other tracks such as “Autobahn” and “Computer Love”, however, reinforce the feeling that many had when The Mix was initially released: what’s the point? They’re not bad versions, but they don’t deviate enough from the originals to really excite. 20 years on, and with remixing having blossomed into an art-form itself, these tracks sound more dated than their originals, coming on like Pet Shop Boys B-Sides from 1988. Having said that, only at a Kraftwerk concert will you ever witness an audience erupting into ecstatic cheers upon hearing a bit of morse code. Credit where it’s due! Personally, I also like the fact that the quartet never really does anything onstage. They don’t smile or acknowledge the crowd, and it’s impossible to determine who is doing what (how cool would it be if it was all lip-synched? ), beyond Ralf Hütter’s singing. There is something remarkably post-modern in this deliberately obtuse approach. However, by focusing backwards, musically, at merely celebrating and rehashing their past, Kraftwerk end up undermining their own aesthetic. The 3D videos are simplistic and cartoon-ish, and a slight staleness permeates even the best moments. Kraftwerk were once a sublimely forward-looking band (I still have to pinch myself at the notion that Radioactivity, Trans-Europe Express and The Man Machine all came out between ‘75 and ‘78), but with this concert, and maybe even the entire series, such avant-gardism has become a thing of the past. As enjoyable as many of these songs are, it seems fitting that I’m witnessing them in a museum. This entry was posted in 2013, Concerts, Unpublished and tagged electronic, Kraftwerk, Live, Pop. Bookmark the permalink.